Alien Influence in DPJ Poll? Foreign DPJ members could influence the choice of Japan’s prime minister. But how much? The ruling Democratic Party of Japan has long championed granting voting rights to permanent foreign residents in local government elections, but, absurdly, a kink in its internal voting system conceivably could hand aliens the opportunity to help pick the next prime minister. DPJ legislators will have the biggest say in whether to keep Naoto Kan as premier or usher Ichiro Ozawa into the prime-ministerial ejector seat, but with their loyalties seeming to be pretty evenly split, votes (about one-third of the total number of available points) by the DPJ’s 2,382 regional assembly members and about 350,000 rank-and-file members and supporters could decide the victor in its September 14 leadership poll. This appears to be perfectly reasonable until you look at the small print of internal DPJ regulations, which state that foreign party members and supporters living in Japan are qualified to vote for the party leader (and in this case, the prime minister). While many senior party members, including Kan and Ozawa, have made it clear they favour local suffrage for foreigners (a thorny issue that has divided liberals and conservatives, and provoking some anger among some of those in the latter political persuasion), it’s inconceivable to picture the two candidates standing on soap boxes advocating the opportunity for foreign citizens to pick the nation’s leader. Yet this is exactly what their party’s regulations state. The party claims that the rule allowing foreign members to vote in leadership elections is part of a policy of openness, but the regulations were drawn up during its long years in opposition, and never before has the party’s membership been able to directly influence the choice of prime minister. 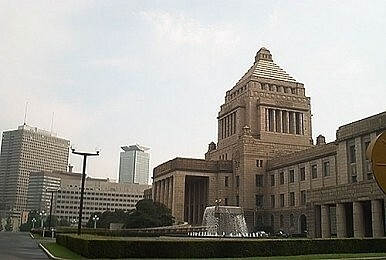 Other parties, including the main opposition Liberal Democratic Party, have rigid rules that permit only Japanese nationals to become party members. It isn’t even a right-left issue, as is borne by the fact that the Japanese Communist Party also has a strict Japanese-only membership policy. The DPJ has said it doesn’t know how many foreign members it has (the number is thought to be small), provoking the right-leaning Yomiuri Shimbun to slam the party’s electoral administration as ‘far too sloppy’ in an editorial Sunday. The local enfranchisement of foreigners with permanent residency (the attainment of which has stringent screening conditions and requires, in principle, at least ten consecutive years living in Japan) is an issue that should be discussed rationally in the Diet and by the electorate at large. But the DPJ has dropped its guard in allowing foreigners to vote for the head of government. If the Kan-Ozawa showdown is as tightly fought a contest as many predict, it could leave the party open to accusations of alien influence.